Klungkung, also known as Semarapura, is a town in East Bali. This is the administrative capital of the regency with the same name. The town is of great historical, cultural, and artistic significance. Gelgel, just to the south of Klungkung, was the seat of the mighty Majapahit empire in the 15th and 16th century which moved to Klungkung itself in the 17th century. This was a golden age for art and culture in Bali, and Klungkung was the centre of it all. More recently, Klungkung forever made its mark in modern Balinese history when in 1908, it was the last kingdom holding out against the Dutch invaders. Hopelessly outnumbered and outgunned, the King of Klungkung (the Dewa Agung or great god) led 200 members of his family and court in a puputan (ritual march to death), into the face of the Dutch guns. All of the group were either killed or committed ritual suicide. Few visitors stay in Klungkung but it is town that many pass through as it lies on the main route between between Ubud and points east to Padang Bai, Candidasa and beyond. 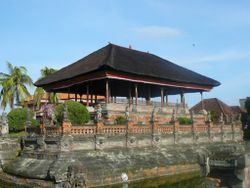 The town is about 25 km south east from Ubud. Make a point of stopping here for a few hours and you will not be disappointed. This is a small town and orientation is not difficult. The town is centred on a crossroads in the middle of which is the large Kanda Pat statue. If you are driving yourself, use this as your key landmark. Try to take it all in. This is a town rich in history and culture. Wayang art in the village of Kamasan. Klungkung is the best place in Bali to buy traditional gongs. Plenty of small local restaurants in the town centre and an excellent night market on Jalan Gunung Rinjani. Very few visitors stay the night in Klungkung choosing instead the nearby beachfront towns of Candidasa and Padang Bai, just 20 to 30 minutes to the south. Klungkung is conveniently located to reach Ubud (25 km to the north) and the south eastern coastal towns of Padangbai and Candidasa. This page was last edited on 9 December 2018, at 19:01.